The best blueberry muffin X the fluffiest brioche au sucre. I swear you'll never eat another Kellogg's Pop Tart after this 10,000 layer, flaky, sweet deliciousness. Inside: fresh raspberry. The breakfast pizza was super cheesy without being overwhelming. They topped it with crispy ham, hard boiled egg and pesto, but it rotates based on fresh ingredients. Make sure you have them warm it up for you since it is in the pastry case. Sandwiches. Where do I begin? The house-made bread? The bacon? 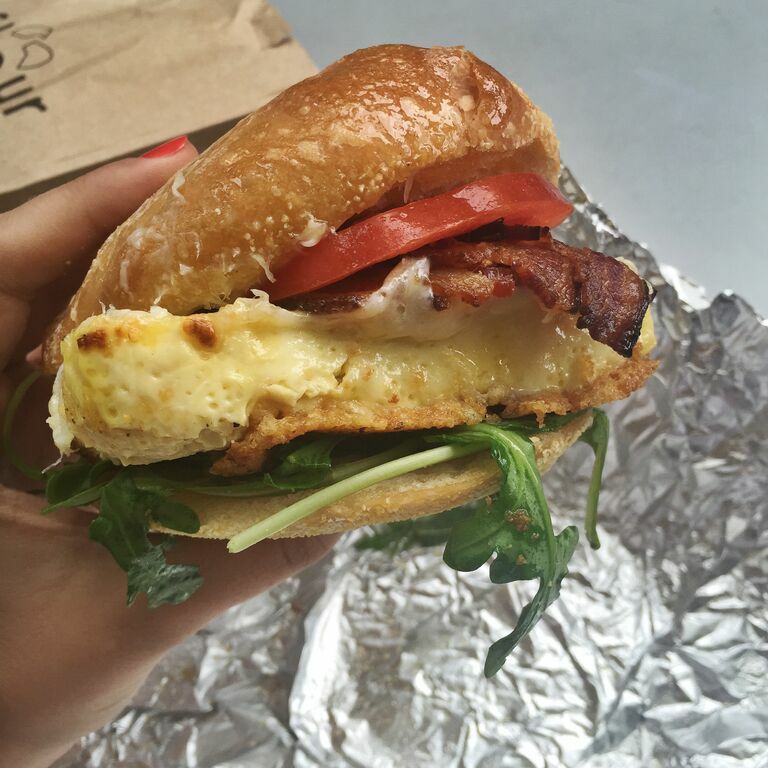 The breakfast sandwich is on their brioche (drool) with mustard, scrambled egg, apple-wood smoked bacon, arugula & tomato. Sometimes I feel that the egg ratio is a bit off but the sandwich is just too good that I don't even mind. As for their BLT's, I think it is in the running for the best I've ever had. The mayo is just right, I love the arugula for a bit of a peppery flavor and the tomatoes are roasted to perfection and melt in your mouth. Of course you can't beat their bread - you have the option of white or wheat which they sometimes forget to ask. They offer house-made gluten-free bread as an option as well. I have not personally tried it but it seems to sell out very quickly. I also recommend any of the other sandwiches on the board (grilled chicken, roast beef, roasted lamb...) Seriously. So. Good. If you find yourself in the Boston or Cambridge area, this is a must stop.